The final of the Regional Schools Mooting Competition took place at the University on Monday, 8 April 2019. The competition started with 10 schools and four reached the final, and the final was judged by expert criminal lawyers from Lanyon Bowdler solicitors. For further information about studying law, visit: www.wlv.ac.uk/law or come to the next University open day on Saturday, 15 June 2019. 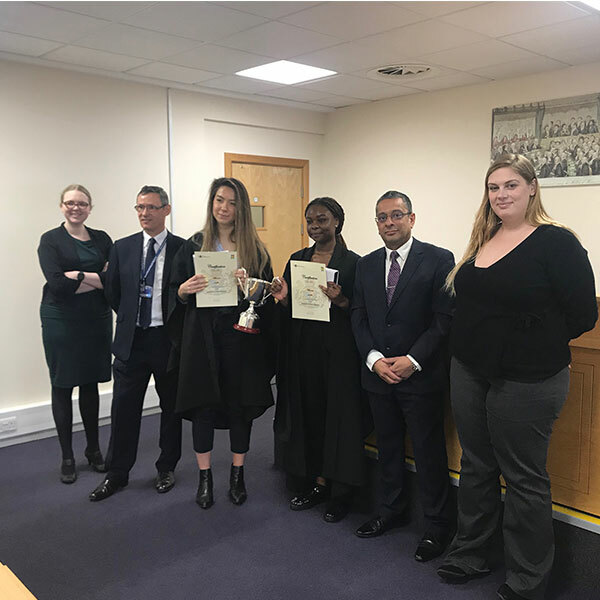 Pic: Solicitor Holly Edwards, Associate Dean Recruitment, Marketing and Outreach Steve Grady, students Sophia Teague and Rhiannon Griffith, Head of the Law School Sukhninder Panesar and Solicitor Lucy Speed.